Enjoy the convenience of 24-hour access to snacks, as well as hot and cold drinks. Vending machines are a great way to support your hard-working team and keep office morale high. They also extend a welcome to business visitors. 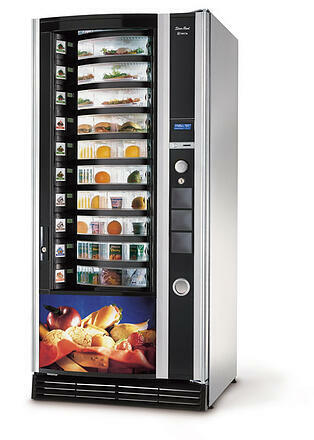 Our range of office vending machines provides a suite of options. The Jazz Combi can dispense chocolate bars and crisps as well as bottled and canned drinks. Many workplaces today want to provide healthier options. The Festival 8 will keep everything from sandwiches, fresh fruit and yoghurt, to plated meals, at the perfect temperature. Can we recommend a machine for you? A welcome addition to any break area or elsewhere in the office, a vending machine is a popular addition for any workforce that wants 24-hour access to hot and cold drinks and snacks. Our range of office supply vending machines provide a perfect suite of options, so you’re bound to find a machine that will satisfy employees and visitors to the business alike. 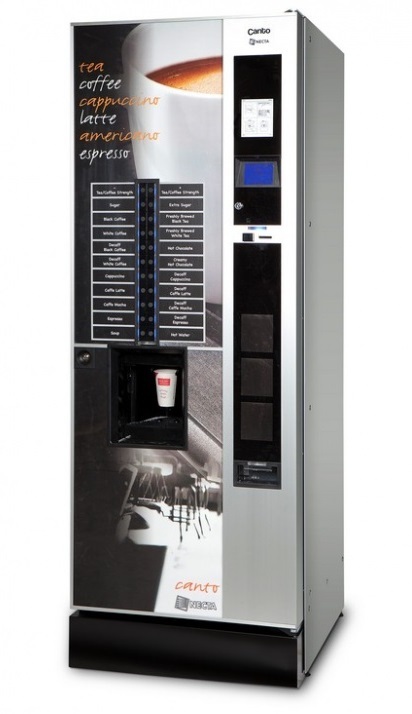 For hot drinks, we stock the popular Canto Coffee Shop machine. A bean to cup and leaf tea vending machine, these fresh, hot drinks are bound to bring pep to the step of your employees. Instant and refreshing, its broad range of options mean that everyone can get a satisfying beverage quickly. When it comes to snacks, the Jazz Combi has you covered. Its compact nature does not compromise on its capacity, allowing you to provide bottled drinks, chilled cans, chocolate bars and crisps to your office. Increasingly popular within offices that want to also provide a healthy option to snacking workers, the Festival 8 provides ready meals, pre-selected sandwiches, fruit, yoghurts, pastries and plated meals, all kept at the ideal temperature. Office supply vending machines make it easy to keep your company’s morale high and support your team. We understand that with so many great options it might be difficult to pick which machine is the right one for your office, but don’t worry, we’re here to help! Contact us at sales@roastandground.co.uk, over the phone at 020 8397 8676, or fill out our enquiry form and we’ll be sure to help you find the ideal vending machine for your business.